A Finger Lakes winery raises awareness and funds for a non-profit corporation that provides crisis intervention services and programs to children in emergency situations. 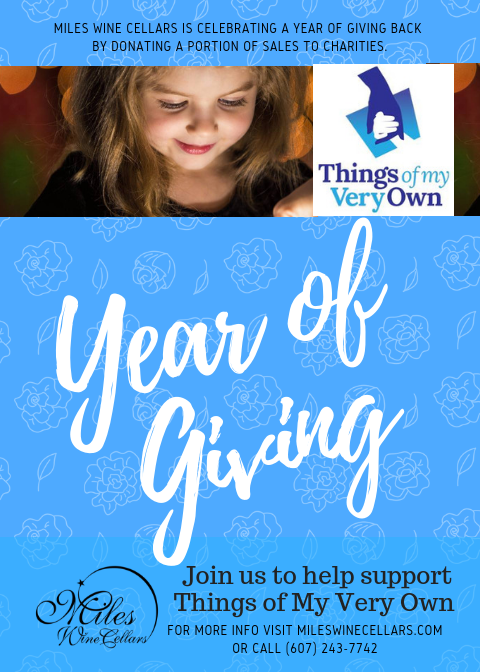 During the month of December, Miles Wine Cellars spotlights Things of My Very Own as part of their Year of Giving campaign. Portions of the sales of this month will go to the charitable organization, and the winery hopes to also raise awareness for the organization. Lately, the organization located in Schenectady, NY, has gotten nationwide attention when it was featured nationwide. Their Holiday Gift Tag program, a program where children write down what they need and wish for Christmas. Rayn Boncie, founder of Things of My Very Own, is pleased that Miles Wine Cellars is spotlighting them. Located on the pristine shores of Seneca Lake, Miles Wine Cellars features award winning Finger Lakes Wine and brews. In addition to being a winery, there is a seasonal cafe and boathouse and guests can lodge year ’round at their Inn at Miles Wine Cellars.